Interior Secretary Ryan Zinke's new ride. Image via Associated Press. On Thursday, the new Interior Secretary rode in style to his office. Ryan Zinke describes himself as a Teddy Roosevelt Republican, and he did his best to channel Teddy, using a one horsepower mode of transportation. Interior Secretary Ryan Zinke’s new ride. Image via Associated Press. 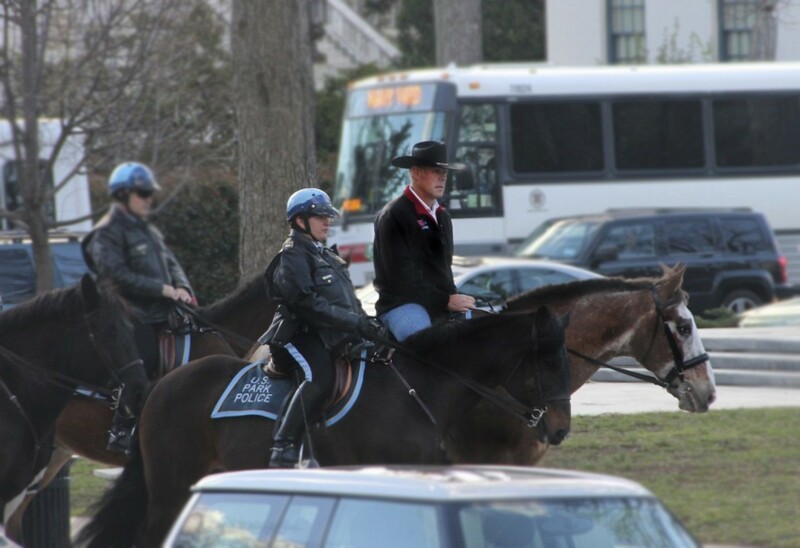 Zinke trotted across Washington, DC, flanked by Park Police officers, while riding a horse. Zinke is a Montanan, and he is clearly determined to leave a distinctly Western mark during his time in office. This is far from the first interesting story from Zinke. When he ran for Montana’s Lieutenant Governor, his running mate was someone who has been referred to as the “most interesting man in the world,” and their campaign sent out a holiday card that was incredibly American. The 26th president once canceled a Cabinet meeting on a warm spring day so that he and his horse could be photographed jumping. Most days, he galloped through Rock Creek Park, mounted on Bleistein or Renown, sometimes rocketing over barriers he’d erected: a stone wall, a bank with a ditch, a 5-foot-7-inch hurdle. Roosevelt didn’t change clothes for his daily ride. He just walked out of the office, put on spurs, a hat and riding gloves, and mounted up. He fretted over how Washington was expanding, because urban growth meant fewer places to ride. It remains to be seen if this will be something Zinke does throughout his term, but it is safe to say that he is saddled up and ready to get to work.